Technology Exhibit: Handling is in the Details -3- - Communication Plaza | Yamaha Motor Co., Ltd.
At the Communication Plaza, we aim to be a place where you can always find fresh new forms of the special excitement and fulfillment we call Kando by creating displays with a variety of current themes and exhibiting the latest Yamaha products. 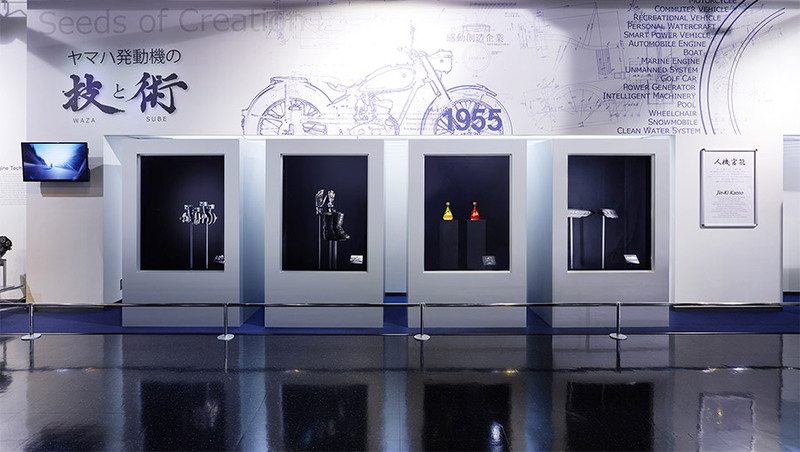 Our “Art of Engineering” exhibit shows the technology and art of Yamaha Monozukuri and it’s one you won’t want to miss. For this third edition, we went beyond the actual steering mechanisms and looked at the finer details of the technology and methodologies that influence a vehicle’s handling, some of which are surprising with the amount of time and effort dedicated to them. We introduced aspects of engines, vehicle testing during development, engine oil and PWC hull components along with the items related to them.